The decision of the government of the United States of America (USA) not to back the candidature of Ms. Gay McDougall for the United Nations Committee for the Elimination of Racial Discrimination (CERD) is a setback in the fight against racism in the United States and around the world. We at MRG are proud and privileged to work with Ms. McDougall in her other capacity as Chair of our governing Council. 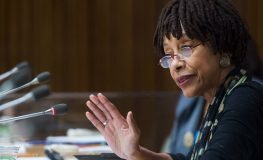 By the end of her current term on CERD in December 2019, she will have served two four-year terms as a member of the UN Committee, starting in 1997, as the United States’ first-ever representative, and then elected to serve a second term in 2015. For 6 years between those appointments she served as the UN’s first Independent Expert on Minority Issues. Currently Ms. McDougall serves as Vice Chair of CERD. Last week, it emerged that the Trump administration had not put forward her or any other candidate’s name to serve as an expert on the treaty body. Ms. McDougall brings a wealth of experience in the difficult task of how to build egalitarian meritocratic societies, and to dismantle structural discrimination that is rife all around the world and prevents a significant proportion of the world’s population from being fully fledged members of their own societies. It is no accident that Ms. McDougall was called upon by Nelson Mandela when South Africa was seeking to find ways to eliminate the odious apartheid system that held its majority population in subjugation for generations. CERD is a body of 18 independent experts charged with monitoring the extent to which the undertakings made by States, to make the necessary administrative, legislative and judicial changes necessary to eliminate discrimination, are upheld. These legally binding undertakings are contained in the International Convention for the Elimination of All Forms of Racial Discrimination opened for signature in 1965, coming into force five decades ago in 1969. It is worth remembering that the Convention came about as a result of fears caused by the growth of xenophobia and antisemitism in Western states, coupled by the ill-treatment of migrant workers into developed economies from poorer countries. ‘In losing one of the few African-American human rights activists who has received truly international recognition, it is also a signal of the kind of politics that is only valid at a time of anger and vitriol. The opposite of the need for the hour: for calm, evidence-based approaches to resolving deep societal problems,’ concludes Castellino.